Design thinking is a proven and practical way to test, build, and solve complex user-centered problems at rapid speed. By bringing different disciplines like engineering, product management, and design into the mix, design thinking enables you to move quickly toward important product decisions. Join expert Naveen Raja to learn how to build a deeper understanding of your users and their experiences. Over three hours, Naveen walks you through the tools and knowledge you need to put design thinking to work in your projects, with a focus on collaboration. You’ll gain exposure to innovative resources and methods to fine-tune your delivery of design thinking, better understand your workflow, help align your team on the users you’re designing for, identify your customers’ problems, and deliver a better user experience. You're a developer working on a legacy or technically challenging product who needs to come up with new ideas of what the product could be. You're a product manager who wants to take your product’s UX to the next level, and you need to understand what you’re building and how to deliver it. You're an innovator who wants to understand your users and deliver an amazing product experience. 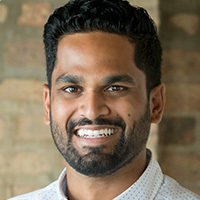 Naveen Raja is a design thinking & strategy facilitator. His passion for design has allowed him to vision, scope and scale design facilitation programs for companies both large and small. Through helping various teams at Consensys, The World Bank, SAP, IBM, Fidelity Investments, Citibank, Marriott Hotels and more he is perfecting his recipe for how to help people to achieve more by using design. He is passionate about how people, places and cultures intermix and the significance it can play on creating an experience.